Yakima, WA – Borton Fruit’s new Soft Net Bag Header Film has arrived and is in production! This new film features our updated Borton Branding along with some exciting and informative characteristic’s that will be sure to catch the consumer’s attention at store level. 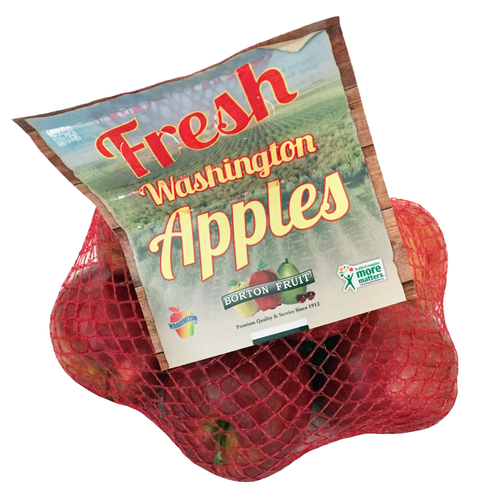 Borton Fruit is currently one of the largest suppliers of Soft Net Bagged Apples in the Produce industry. We have always offered multiple netting colors and multiple colored generic header film options, each color complimenting different apple varieties. 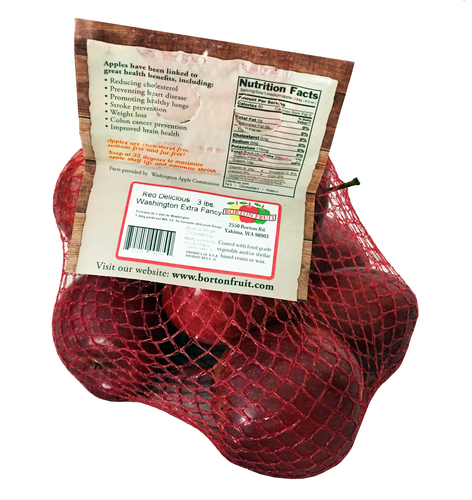 We will continue to offer all of the different netting options to pair with specific apple varieties, but in order to update our branding and offer new high graphic consumer focused film, will be transitioning our bagging program to feature this new film (please see below) on all apple varieties. 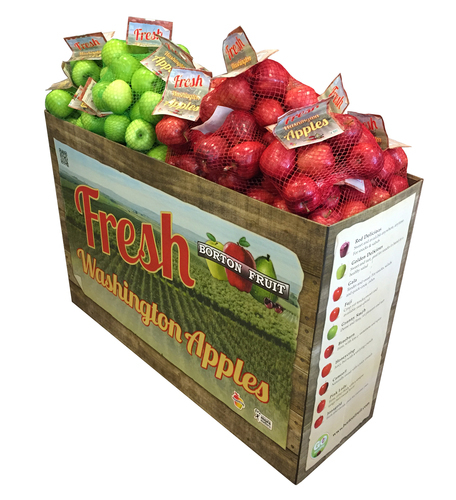 Our new Soft Net Header Film was designed to tie in with Borton Fruit’s new merchandising display bins, for an eye-catching display perfect in any produce department. 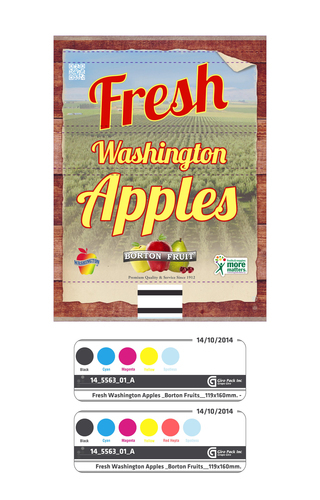 On the front of the new label, one of our high density orchards is featured on the background graphics, with a wooden bin edging, matching the front panel of our bin. This allows the consumer to connect with the Farm where the apples were grown. 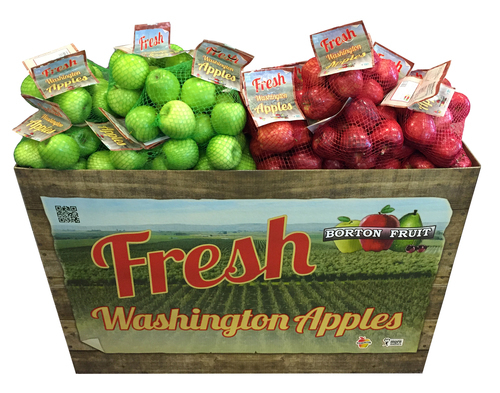 We have also added some highly consumer recognized logos; The Washington Apple logo and the Produce for Better Health’s fruits & veggies- more matters logo. In addition, we have added our company logo and QR code allowing the consumer to reach out to us and get more information about the fruit they are purchasing. 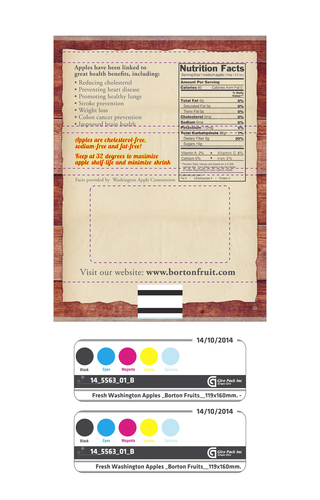 On the backside of the film, we highlight nutrition facts, health benefits and storage tips tailored for helping consumers feel confident in their purchase while learning some great nutritional benefits of apples. We are excited about our new header and the added benefits it provides for both the retailer and the consumer. Our goal is to be able to help our customers merchandise our fruit better while connecting with the consumer more, allowing them to gain insight into our 100 year old Family farm. Please contact your sales representative today to get these in your stores.